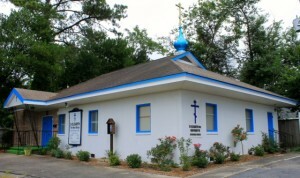 If you are Orthodox and you wish to commune, please try to contact Fr. Mark at least a day in advance of the Sunday (or feast-day) liturgy you plan to attend. If you would like to make your confession before liturgy, please arrive 30 minutes early. 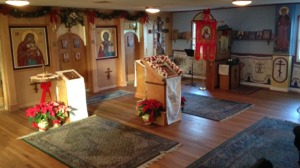 Most of the liturgy is in English, but some portions are in Church Slavonic. Small candles are $1.00; large candles are $1.50 and available on the table to your left in the narthex. Memorial loaves are available for a small donation. Please arrive on time for church to submit your memorial list. We respectfully ask that you dress modestly and appropriately when you enter the House of God. Please feel free to ask the person standing next to you if you need to know something. Only Orthodox Christians are allowed to receive Holy Communion. During the services, most of the congregation will be standing. There are chairs located around the sides of the church in which you are welcome to sit. However, there are portions of the service in which we ask you to stand: the reading of the Holy Gospel and the Lord’s Prayer are two examples. When you enter an Orthodox Church you will realize that there is a great deal of movement and activity by both the priest, the servers, and the people: bowing, censing, candle-lighting and a general changing of position. A person in the church might ask you to stand up or to move aside. All of this is normal, and nothing to be embarrassed about. CHILDREN OF ANY AGE ARE WELCOME in the church. Jesus said “do not forbid them” so anyone who comes to our church can expect a reasonable amount of activity and noise from the children and their parents. Likewise, you should not feel embarrassed about a reasonable amount of noise from your own children. If you need to, though, you can take your child outside the church. We welcome you to stay for the meal that follows the Sunday service and to speak with the priest.